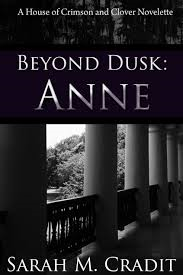 Beyond the Dusk: Anne by Sarah M. Cradit is a novelette and part of the Crimson & Clover series. This story focuses on The Fontaines in New Orleans. Anne Fontaine Deschanel has arrived in New Orleans in search of her sister, Adrienne. Anne and Adrienne had not parted on the best of terms. All Anne wants is to reconnect with her sister again. She is aware of a brother named Nicolas, but they've never met. So, when Oz informs Nicolas that yet another person is claiming to be related to Adrienne, he decided to have a little fun with the girl calling herself "Jane".Presuming Anne is just another fortune hunter, he meets up with her at he hotel bar and deliberately keeps his identity from her. This is a very dangerous game Nicolas is playing with "Jane". Suffice it to say, Nicolas rather underestimated Anne. He's gotten a whole lot more than he bargained for. I really enjoyed this part of the series. New Orleans is one of my favorite locations and I could see the gardens and flowers and smell the aromas of the city. Nicholas is a character I have mixed emotions about. I'm just not sure how to feel about him. He is a jerk a lot of the time, but when it comes to family, he is as loyal as they come, usually. He gets his comeuppance with Anne. You will not want to miss this installment in the series. Anne has a lot to offer and will be a valuable asset to the family. Another solid effort from Sarah Cradit. This one gets an A.